The Army's JLENS surveillance blimp takes to the skies over Maryland. Be warned, all those from North Carolina to Massachusetts receiving quadrocopters and various and sundry flying devices for Christmas. Your government may be watching you—from a giant militarized blimp. 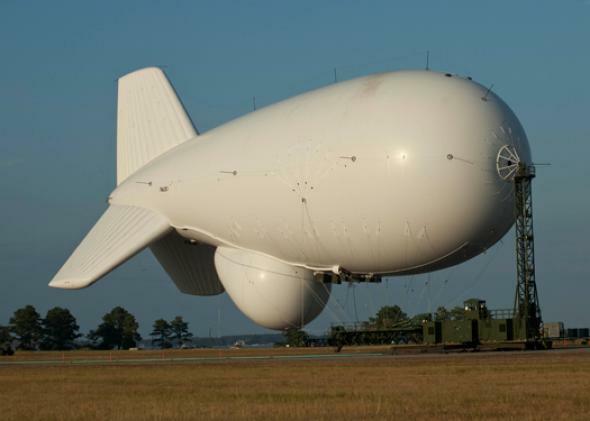 Dan Froomkin reports in the Intercept that in the next few days, the Army will launch the first of two planned surveillance blimps, or helium-filled aerostats, from the Aberdeen Proving Ground near Baltimore, Maryland. As Slate has previously noted, the Raytheon Company-built blimps, succinctly known as the Joint Land Attack Cruise Missile Defense Elevated Netted Sensor System (JLENS), are intended to watch for missiles. They’ll hover at a height of 10,000 feet, and at around 600,000 cubic feet each, they’ll be a sizeable floating landmark near the Interstate 95. The blimps will be able to constantly scan up to 340 miles in 360 degrees, reaching from Raleigh in North Carolina to Boston—an area the size of Texas, as Froomkin points out. The Army has been exploring the use of airships in warzones for a number of years. But the Baltimore blimps’ 24/7 radar mean that they’re technically capable of watching for more than just missiles or hostile aircraft and drones. Although representatives for the JLENS program deny that they will be used to track people or civilian cars, Raytheon PR materials have boasted that their system is able to detect and follow cars, trains, boats, and trucks. Civil rights groups are particularly concerned about the potential for mission creep—“If we’re going to have massive blimps hovering over civilian areas, or within radar-shot of civilian areas, then we need some very ironclad checks and balances that will provide confidence that there’s no domestic surveillance going on,” the ACLU’s Jay Stanley told the Intercept. Until I’d heard of this new generation of military airships, my only association was the Hindenburg and The Simpsons’ Duff Blimp. Now whenever I hear “Hey there, blimpy boy, flying through the sky so fancy free,” I’m not going to think of a beloved American cartoon series. I’m going to think of omnipotent surveillance. Thanks, JLENS.